'St Thomas's Mount', Madras, W.H. Lithograph at the Madras Artillery Depot by William Hunsley, c.1830. bl.uk > Online Gallery Home	> Online exhibitions	> Asia, Pacific and Africa Collections	> 'St Thomas's Mount', Madras, W.H. Lithograph at the Madras Artillery Depot by William Hunsley, c.1830. 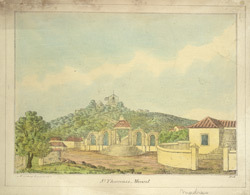 Coloured lithograph by William Hunsley of St Thomas's Mount at Madras, dated c.1830. The mount is 11 km south of Madras and is traditionally held to be the site of the martyrdom of the apostle St Thomas. It is thought that he founded Christian communities on the west coast of India and came to Mylapore, where he was killed in 68 AD. A flight of granite steps marked by 14 Stations of the Cross ascends the mount to Our Lady of Expectation Church, built in the mid-16th century by the Portuguese who established a Mission at the mount. The steps were built by Petrus Uscan, a notable member of the Armenian community of old Madras. The military cantonment, consisting of barracks and colonial-style bungalows, lay at the base of the mount. It was the headquarters of the Madras Artillery.